In July, the International Finance Corporation (IFC), a member of the World Bank Group, approved US$660 million in funding for 11 Egyptian solar plants, with an installed capacity of 490 megawatts. These projects are being co-financed by the AIIB with additional funding of US$210 million. This follows investments in Egyptian solar from other development banks, most of which are being directed at the small town of Benban, which lies just 25 miles south of the ancient city of Aswan in the south-east of the country. In June, the European Bank for Reconstruction and Development agreed framework funding of US$500 million for up to 16 solar plants totalling 750 megawatts. This funding is also expected to stimulate private investment in more than four gigawatts of wind and solar power. In total, there are 39 developers working in Benban to establish a solar power hub of 41 solar plants, with a total generation capacity of 1.8 gigawatts. The Egyptian government is targeting two gigawatts of solar power by 2020, relying almost entirely on this one area. The investment in renewables in Egypt is part of a much larger push to expand the country’s grid. In 2014, Egypt had 32 gigawatts of installed capacity but is investing heavily in new gas-fired plants, coal and nuclear, as well as renewables. The AIIB’s investment in Benban solar should avoid 500,000 tonnes of carbon emissions annually. It also comes less than three months after the bank published its Energy Sector Strategy. Joachim von Amsberg, an AIIB vice-president, told chinadialogue that the investments in renewable energy should facilitate member states to make a low-carbon transition and achieve commitments under the Paris Agreement. Von Amsberg indicated that the AIIB still has no plans to invest in coal and other fossil fuels, which is a running concern of environmental groups. But he also revealed the bank has not yet set a target for what proportion of its energy sector investments should be in renewables. Africa has 15% of the world’s population but accounts for only 3% of global primary energy use. The continent has 600 million people with no access to electricity, principally in the sub-Saharan region. Limited energy infrastructure means that energy demand is met mostly from bioenergy and fossil fuels. But high population growth and urbanisation is resulting in rapid energy demand growth. In 2014, the International Energy Agency (IEA) predicted that the economy of sub-Saharan Africa would grow fourfold by 2040, and energy demand by 80%. The IEA predicts that renewables will meet half of this demand by 2040, helped by rapid cost reductions in solar. IEA data shows that in 2013 and 2014 the cost of a kilowatt hour of solar power in Africa was between US$0.13 and US$0.24 – but that fell to US$0.075 in 2015. Can the Egyptian model succeed? Egypt is regarded as a “sunbelt” state, with between nine and eleven hours of sunshine per day. However, utility-scale solar is just getting started, according to Yasmina Abdelilah, an analyst with the IEA’s Renewable Energy Division. Currently the bulk of Egyptian solar power is in mini or standalone grids that are unconnected to the main grid, and which total less than 100 megawatts. 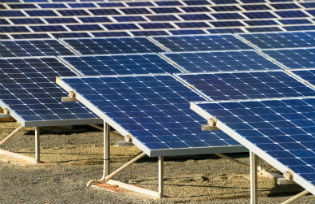 But as well as meeting its own growing electricity demand, the country is looking to become an exporter of renewable energy through interconnections with Saudi Arabia, and potentially North African countries, Europe, and Sudan. The government has set long term solar power targets and put in place feed-in tariffs and competitive auctions to encourage investment and provide developers with stable profits. Utility-scale solar will provide 1.7 gigawatts, with distributed solar of 0.3 gigawatts making up the two-gigawatt target. DJ Pandian, an AIIB vice-president and chief investment officer, said that the 11 solar plants the bank is investing in will help Egypt become a renewable energy hub, and spur economic development for the whole region. Of the 11 solar plants the AIIB is co-financing, nine are 50-megawatt plants and two are 20-megawatt. These are “medium-sized investments, more appropriate for emerging nations to study and adopt, and with a manageable level of risk,” according to Bai Yunwen, researcher at Greenovation Hub, a Chinese environmental NGO..
Egypt has one of the most developed and well managed power grids on the continent, according to one anonymous insider from the Chinese electricity sector. But this stands in contrast to most grids in Africa, which tend to be smaller, less resilient and poorly managed, posing significant risks to investors. This also places a limit on Egypt’s ambition of becoming a renewable power hub. Wu Yixiu and Lili White also contributed to this article.